MilitaryVetsPX.com - Construction Mechanic CM for sale. 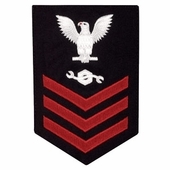 This is the appropriate rating patch for US Navy personnel with the rating of Construction Mechanic CM1, CM2, or CM3. Navy rates are only sold as first class rates and can be cut to second or third class. Construction Mechanics (CM) are responsible for the maintenance of construction machinery such as buses, dump trucks, bulldozers, rollers, cranes and other US Navy heavy construction equipment. They work on gasoline and diesel engines and transmissions and repair all electrical, hydraulic, steering, and other systems on this equipment.